Identity & Access Management « Global Market Insights, Inc.
Industrial control systems (ICS) security market, tagged as one of the most revolutionary verticals of the smart & sustainable technologies space, has garnered massive remuneration in the recent years, given the increasing demand for network connectivity to support critical infrastructure. Industrial automation and digitization trends have practically computerized most of the machinery and engineering components that have undeniably changed the way operations are now performed but have however increased attack surface areas. Reports in fact claim that the industrial sector witnessed a significant increase in the number of vulnerabilities in ICS between the years 2015 and 2017. It has been estimated that the number of vulnerabilities reported by major companies offering ICS solutions were 115 in 2016 and the number rose to over 197 in 2017. 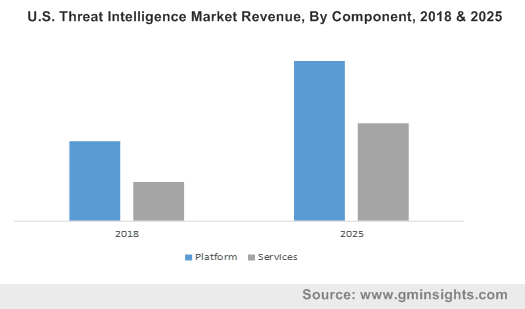 The growth in the ICS security industry can be attributed to these rising malware attacks that generally drain the bank accounts, steal identities, and blackmail organizations to bring services to a halt. A significant instance is that of the NotPetya ransomware that shut down several industrial IT networks across the U.S. and Europe. The gigantic outbreak resulted in losses of thousands of millions of dollars for large enterprises, from pharmaceutical company Merck to shipping firm Maersk. WannaCry was another popular ransomware that caused enormous damage, however it was later realized that this unsophisticated attack could have been easily prevented by following the basic IT security practices. The robust prevalence of incidences similar to the aforementioned has served as a pivotal driver for ICS security market. Owing to these constantly evolving cyberattacks that are becoming more commonplace, security concerns have grown considerably in recent times, resulting into robust demand for ICS security solutions. Speaking of the growth in the commercialization potential, reports claim that the industrial control systems security market bagged USD 1.5 billion for the year 2017 and is expected to thrive further with industry players focusing on strategic collaborations and product innovation trends. Kepware’s latest release of the KEPServerEX® version 6.5 industrial connectivity platform, in this regard is quite an example of the rising product innovation & diversification trends in the industrial control systems security market. The company’s new product launch demonstrates its commitment to ICS security and its word in providing customers with best tools and services that support defense-in-depth programs. According to reports, the 6.5 version, which existing users can now avail for free, includes features such as enhanced password configuration, greater project file protection, comprehensive secure deployment guidelines, and other updated security components. Kepware, a business arm of PTC, also claims that it will introduce a Shared Responsibility Model that will enable the company to work together with its customers and address security issues experienced by industrial organizations of all sizes. Industry experts speculate that in today’s security landscape, the real pressure on all the industrial enterprises is to secure their operational networks. And Kepware’s commitment in adding new security features and maintaining up-to-date components that would help customers reduce exposure to cyber-attacks and vulnerabilities will in turn strengthen its footprints in the competitive landscape of the global ICS security industry. The partnership between Rockwell Automation and Claroty is another fine instance that portrays how leading industrial control systems security market players are constantly expanding their reach through such strategic collaborations. The partnership between the two is expected to develop a purpose-built anomaly detection software for the industrial network security. Numerous other leading ICS security industry players like Cisco, Honeywell, IBM, Schneider Electric, and GE Digital are also expected to keep pace with the changing dynamics of cyberattacks while ensuring the delivery of comprehensive security solutions. On grounds of these efforts being undertaken by the industry players to innovate advanced & efficient products, industrial control systems security market is certain to tread along a lucrative roadmap in the years ahead. 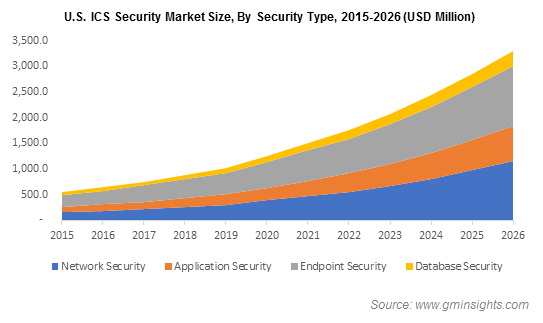 As per Global Market Insights, Inc., the overall industrial control systems security market size has been forecast to be pegged at USD 7 billion by 2024. This entry was posted in Sustainable & Smart Technologies and tagged Anti-Malware, Antivirus, Application Security, Audit, Component, Consulting, Data Loss Prevention, Database Security, DDoS, Distributed Denial of Service, DLP, Endpoint Security, Firewall, IAM, ICS Market, ICS Security Market, ICS Security Market Size, Identity & Access Management, Industrial Control System Market, Industrial Control Systems Security Market, Integration, Intrusion Detection, Intrusion Prevention, Managed Service, Network Security, Reporting, Risk Management, SCADA Encryption, Security Information and Event Management, Security Type, Service, SIEM, Solution, Unified Threat Management, UTM, Virtualization Security.